Home 40th ODI hundred virat kohli Nagpur: Kohli his 40th ODI hundred. Nagpur: Kohli his 40th ODI hundred. 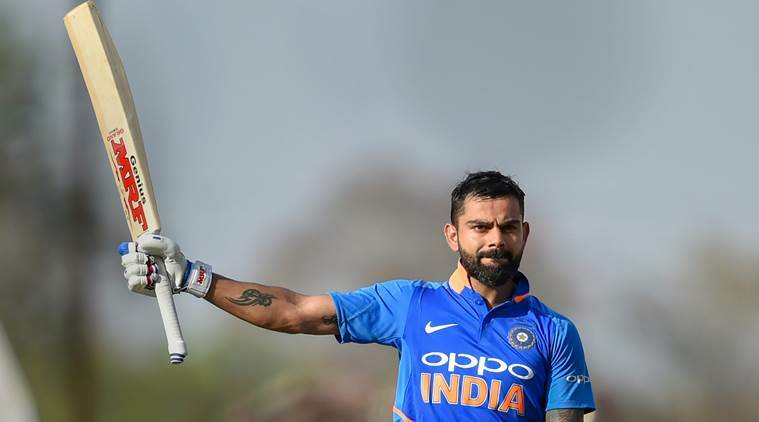 Captain Virat Kohli, on Tuesday, struck his 40th ODI hundred to play a major role in India's 8-run victory over Australia in the second ODI, in Nagpur, but he sought to downplay his achievement and instead lauded his team-mates for the win. "It felt good (to get to 40 ODI hundreds) but it is just a number. It feels good to win games for India," Kohli said after the match. Kohli hit 116 from 120 balls to guide India to 250 all out from 48.2 overs after being put into bat. Chasing 251 for a win, Australia were bowled out for 242 in 49.3 overs. "When I walk in to bat, when the situation gets difficult, I have no choice but to put my head down and bat through the innings," Kohli added. Pacer Vijay Shankar scalped the last two Australian batsmen in the final over in which the visitors needed to score 11 runs for a win. Handing the ball to Shankar at the make-or-break situation was a bold decision by Kohli. "I was thinking of using Vijay in the 46th over, but I spoke to Rohit and MS (Dhoni) and they said, let's stick with Shami and Bumrah, and if they get some wickets we're on top. That is exactly what happened. Vijay kept it stump-to-stump, kept it simple, and it worked," said the skipper. "It's always nice to speak to Rohit, he's the vice captain. MS (Dhoni) has been around for so long, and you go and speak to the bowler as well. Invariably they're all on the same page," said Kohli. About Bumrah who returned with figures of 2/29, Kohli said, "He (Bumrah) is a champion, two wickets in an over, just turned the game, happy to have him in our team." On his side's batting, he said, "I'm more proud of our second innings than our first. Vijay Shankar batted (46) outstandingly, but he was unfortunately run out and we lost Kedar and MS in quick succession." He said winning these kind of close games will give his side confidence ahead of the World Cup. "It's important to look ugly at times, and come through and win. We might get these low-scoring games in the World Cup as well," said Kohli. "This kind of a pitch was tailor made for Kedar Jadhav, he was actually keen to bowl the last over as well." Australian captain Aaron Finch said Kohli's hundred made the difference in the outcome of the game. "If one of our top order got 80-100, we would have probably won the game. We got the starts, but starts don't win games. We got 30s and 40s, they got a hundred, and that was the difference," he said. "It was one of those games where you take it as deep as you can and hope you can get over the line." Finch praised Marcus Stoinis (52) for playing a brilliant innings. "If Stoinis takes a risk early on and gets out, we have no chance at all, so his approach was right." "The game ebbed and flowed the whole day. We had momentum, gave it back to them, and in the end they got over the line."